training command near Chicago. It's where all enlisted sailors begin service. Secretary of the Navy Ray Mabus announced names for five new submarines Friday. They will be named the USS Illinois, the USS Washington, the USS Colorado, the USS Indiana and the USS South Dakota. 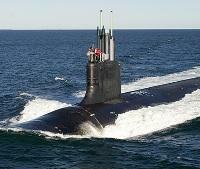 The next-generation submarines have sophisticated surveillance capabilities and special warfare enhancements. They can attack with tomahawk missiles. The submarines weigh 7,800 tons and are 377 feet long.